Pilot the stealth fighter to execute your patrol mission! Taipei, Taiwan, 08 July, 2013 – GIGABYTE, a leading manufacturer of premium hardware, is pleased to announce a new gaming keyboard – FORCE K7 Stealth Gaming Keyboard, the embodiment of stealth fighter. The scissor-key structure completes its’ slim and solid body, and also achieve the extreme short actuation distance and stable key presses. With 3-color switchable backlighting, gamers never need to worry about not being able to locate your keys precisely in dark conditions. Anti-ghosting capability around WASD cluster guarantees the general gaming combination keys are registered and executed without conflict. 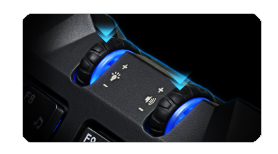 Intuitive twin wheels offer prompt control of keyboard backlight and volume during your intense gaming session. Now, are you ready to pilot FORCE K7 to eliminate the enemies? Built with slim scissor-key structure, FORCE K7 ensures extreme short actuation distance and stable key presses. 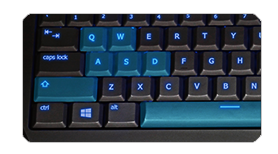 Ultra-slim keycaps also minimize the typing effort in keyboarding. Anti-ghosting capability around the WASD cluster on FORCE K7 guarantees the general gaming combination keys are registered and executed without conflict. Never have to worry about the missing signal failure during you press multiple keys simultaneously for the gaming commands. FORCE K7 supports up to 7 simultaneous key-presses without conflict including Q, W, A, S, D, left shift and space. Lighting up in the darkness, FORCE K7 offers 3 switchable illumination color options, blue, green and cyan. Furthermore, gamers can stepless adjust the backlit to find the optimum brightness level based on your background conditions. FORCE K7 features with intuitive wheel based volume and backlit illumination controller for easy hassle-free adjustments during intense gaming sessions. 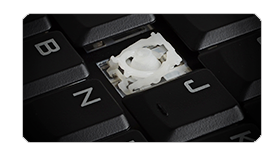 The Win-lock key with independent indicator allows you to disable the Windows key and prevent accidental activation of the Windows Start function during gaming session. 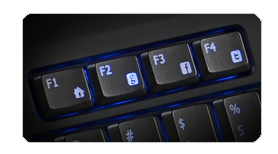 Gamers will never be worried about throwing your game by hitting the wrong keys. The convenient function keys, F1 to F12, offer you a quick and easy access to the most common functions and social networking sites.